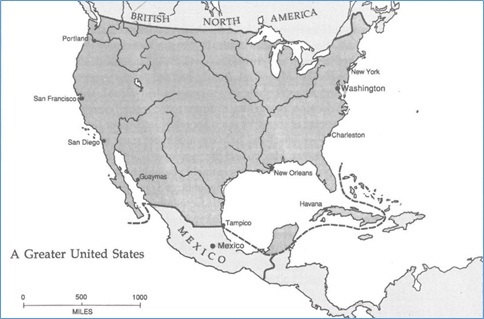 So it seems that in 1847 the United States nearly annexed the Yucatán when the 2nd Republic of Yucatán President Santiago Mendez made a formal offer for the annexation of Yucatán to the United States, an argument that appealed to some of the radical expansionists and the Young America movement. President James Knox Polk was pleased with the idea and the "Yucatán Bill" passed the United States House of Representatives, but was discarded by the Senate and thus nothing came of the annexation of Yucatán. Another article can be read on the Yucatán Times called: Yucatán, USA? The governor of the independent Republic of Yucatán had dispatched Sierra as its special “commissioner and agent.” The United States and Mexico were at war, and although Yucatán had declared itself a nonbelligerent, the U.S. Navy was occupying the important seaport of Carmen and pocketing badly needed tariffs. Sierra’s assignment was to win relief from the trade restrictions. Sierra got the appointment because of family connections. He was the son-in-law of Santiago Méndez Ibarra, three-time governor and leader of the Campeche faction in the Republic’s contentious government. Born the illegitimate son of a housemaid in remote Tixcacaltuyub, Sierra had improbably become a prominent lawyer, journalist, and novelist. His father was likely José María Domínguez, the priest who employed his mother, María Sierra O’Reilly. Priests in Mérida became his protectors and patrons after his father died. He received an excellent education, became politically active, and moved to Campeche as a judge. The commissioner sailed from Campeche on September 12, 1847 and reached New Orleans aboard the merchant steamship Alabama on October 4. Serious illness struck in New Orleans, likely yellow fever or malaria. While delayed, he received news of civil war in Yucatán and the overthrow of the Méndez faction. Sierra considered returning home, but a message from Méndez urged him to continue. The journey on to Washington took three weeks. After travelling by steamboat up the Mississippi, Ohio, and Monongahela Rivers, Sierra crossed the Allegheny Mountains by stagecoach to Cumberland, Maryland. Beginning to experience the cold weather of the North, he boarded a train, which deeply impressed him — railroads were unknown anywhere in Latin America at the time — and reached Washington on November 16. Sierra went to work immediately, sending a letter to Secretary of State James Buchanan the next day. Buchanan agreed to a meeting on November 22. Sierra arrived with a translator — he could speak and write some English, although evidently not up to the level of international diplomacy — and presented his credentials. The meeting was cordial and ended with Sierra’s agreeing to write a memorandum describing the situation in Yucatán. His lengthy document delivered to Buchanan two days later focused on Yucatán’s neutrality and independence, the occupation of Carmen, and collection of tariffs. Sierra waited with growing frustration more than a month for a reply, using the time to cultivate relationships with members of Congress and write repeated entreaties to Buchanan. When Buchanan at last responded on Christmas Eve, he reported that the President, James K. Polk, had denied most of Sierra’s requests. Polk would maintain the occupation of Carmen and would treat Yucatán as part of Mexico, although with a special neutral status. He agreed to lift tariffs on shipments within Yucatán, though, so Sierra’s efforts yielded at least a minor victory. At year-end, Justo Sierra O’Reilly received alarming news that changed the focus of his mission. The Indian uprising in Yucatán, which had seemed like a local problem when he left, had become far more serious. Major cities were threatened, and the government urgently needed help to avoid disaster. In the early months of 1848, Sierra hammered away with the new message. The Maya war now completely overshadowed the tariff issue. He repeatedly sent letters to Buchanan, met with Buchanan’s political rival, Vice President George Dallas, spoke with senators, and published letters in newspapers. Savages had declared a war of extermination. Surely the civilized United States did not want Yucatán to fall into the hands of savages. But the United States was blocking shipment of desperately needed arms, while the British in Belize supplied the Indians. Through a gloomy February, no response came from Buchanan. On March 7, Sierra sent his most forceful letter yet. Indians at the door of the capital! Annihilation fast approaching! U.S. continuing to restrict trade! Spanish warship arriving with aid! On his own authority, Sierra now specifically asked for direct intervention, two thousand U.S. soldiers and a half-million dollars, worth about fourteen million today. Buchanan read the letter in a Cabinet meeting the same day. After initial objections, the President sent orders to permit arms delivery on humanitarian grounds. Surplus U.S. powder and muskets from Mexico did eventually arrive in Yucatán, and payments of duties at Carmen were eased. Sierra had won some incremental concessions, but the news from Yucatán — many weeks in transit — was increasingly dire. His desperate requests continued, with no response from Buchanan, who was away on vacation. For the first time, he began citing the policy later called the Monroe Doctrine, recently reaffirmed by Polk: The U.S. would view interference in America by European nations as acts of aggression. Could the United States choose to remain passive and let Spain or Great Britain intervene in Yucatán? Then a remarkable message came in from Yucatán. On March 23 Santiago Méndez sent identical letters to the governments of the United States, Spain, and Great Britain, with corresponding instructions to Sierra. Yucatán would surrender its sovereignty to any nation that would come to its rescue. The idea of foreign protection at tomes of trouble was not an entirely new one for independent Yucatán. Méndez had considered annexation by the United States, and his rival, Miguel Barbachano, liked the idea of reverting to Spain. Great Britain was aggressively expanding its influence in Central America at the time and seemed like another possibility. In Washington, Justo Sierra O’Reilly was disgusted with idea of Yucatán’s annexation by the United States. “With great repugnance,” he sent the message forward into the slow State Department channels on April 21. But Buchanan had received the letter directly from Méndez and presented it to the President the next day. On that same day, Saturday, April 22, 1848, Sierra sent a letter to the President requesting an audience, bypassing the unresponsive Buchanan. President Polk agreed to meet that very evening. Sierra arrived with his interpreter, a Dr. Baldwin, at 9:00. Knowing Polk’s distrust of Great Britain, Sierra played on the idea that Yucatán might have to submit to British power to survive. Polk listened courteously, expressed sympathy for his requests, and promised to do what he could. Sierra later had only favorable comments about Polk and was charmed by the republican simplicity of the White House — the President himself showed him to the front door. On the following Tuesday, the Cabinet took up the Yucatán issue. Polk stated that he would never allow it to fall into hands of a foreign monarchy and was in favor of “ultimate annexation.” He directed Buchanan to draft a message to Congress urging intervention. President Polk sent his Bill for the Relief of the Yucatán to Congress on April 29, 1848. His accompanying message urged its passage for both security and humanitarian reasons. The bill called for temporary military occupation, but no one doubted that it could become much more than that. In an election year, it fell immediately into a storm of party and racial politics. In the years immediately before the Civil War, issues of race obsessed the United States. The issues were binary, either-or. People understood the clear, immovable line between black and white. They understood Indians and had given up any idea of assimilation in favor of eradication or removal. They were very uncertain about the complex racial nature of Yucatecans — white, Spanish, Mexican, mixed, Indian, or what? How were they different from the racially ambiguous and untrustworthy Mexicans recently defeated? Even though Sierra personally opposed annexation, he worked to win passage of the bill and aid for his homeland. He understood the race issue and cast the conflict in stark binary terms understandable to the legislators: Whites versus Indians, civilization versus barbarism. The President’s message to Congress was remarkably similar to Sierra’s. Senator Edward Hannegan, Democrat of Indiana and an even more rabid expansionist than Polk, had the responsibility for getting the Yucatán bill through Congress. He urged his colleagues to “defend white civilization against barbarous savages” and to take Yucatán in order to prevent Britain from seizing all of southern Mexico. Some reputable sources say the House of Representatives passed the bill, but official records show this is not true. The House debated the bill only one day and quickly referred it to the Committee on Foreign Affairs, where it lay dormant, awaiting action in the Senate. The Senate Committee on Foreign Relations reported the bill to the full Senate on May 4, and lively debate continued during the next two weeks. The national security argument was prominent but controversial. Senator Jefferson Davis of Mississippi said, “The cape of Yucatán and the island Cuba must be ours” to protect the Gulf, “water belonging to the United States.” Other Senators from southern states opposed annexation because slavery was illegal in Yucatán. Some challenged it on racial grounds, using terms about the “Yucatanese” that are very distasteful, even unprintable today. Some saw Yucatecans as not quite civilized and not quite white, unworthy of help. Senator John C. Calhoun of South Carolina rejected the “white-civilization” argument and called Yucatán “a worthless country.” Yucatán’s political instability was troubling, and some argued that the war there was just a political dispute of some kind. And yet the arguments for national security and humanitarian relief were strong, and it looked like the bill could pass. As the debate progressed in Congress, Justo Sierra O’Reilly continued working behind the scenes for the bill’s passage. He had many meetings with Congressmen. He stoked rumors that Britain intended to control Yucatán and all Central America. He worked the press. The New York Herald published an article planted by Sierra approving annexation and urging the take-over of Tabasco and Chiapas as well, so the United States would control the Isthmus of Tehuantepec. Final arguments on the bill were scheduled for May 16, when news arrived that changed everything. Miguel Barbachano and a leader of the Maya revolt, Jacinto Pat, had signed the Treaty of Tzucacab. It was a bogus agreement, accepted by almost no one and abrogated within days, but the U.S. press accepted it as an end to the Caste War. Newspapers reported that “San Jacinto Pat” was actually of Irish ancestry. It had not been a war of extermination after all, just been a squabble between political factions.